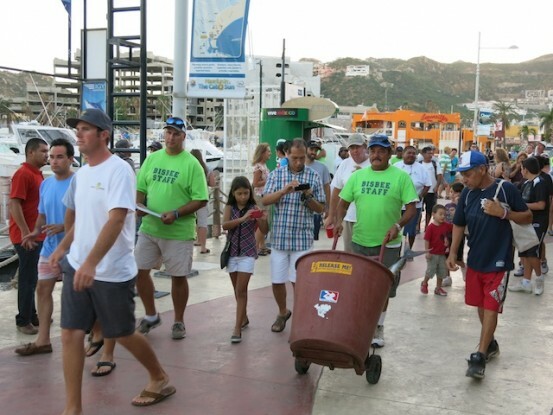 Tuna were the featured attraction in the bright Baja sun as the second and final day of the 2014 Bisbee’s Los Cabos Offshore Tournament drew to a close Sunday evening. And for the second day in a row, Erik Esteves and his team fishing aboard Deep Color was the big winner. Esteves scored the biggest prize, a 60.7-pound yellowfin, to sweep the daily game fish category. No qualifying marlin or dorado were weighed on the last day. Like the previous outing, Esteves fooled his fish with a squid soaked deep near the Gordo Bank. It was landed on 80-pound line and leader. Team mates Daniel Miranda and Modesto Miranda also boated tuna, but neither made the 40-pound minimum cut-off. Ray Auslander, competing aboard Bull Rider, brought a yellowfin to the scales just before closing but the 53.9-weight wasn’t enough to dislodge Esteve’s earlier mark. Several dorado brought to the scales on Sunday as well. However, none were large enough to get on the leaderboard. Dorado must weigh a minimum of 30 pounds to qualify. The tournament radio channel was chattering throughout the day with reports of smaller blue marlin, striped marlin and sailfish releases. A couple of boats were hooked up with bigger fish for a couple hours only to pull the hooks. As a result, the 322-pounder captured by Los Rudos on Saturday was the sole billfish to meet the 300-pound minimum. Like the East Cape Offshore Tournament held in August at the Hotel Buena Vista Beach Resort, the LCO has a competitive game fish division, with many boats strictly targeting tuna and dorado. Shifting into the Black & Blue Marlin Tournament this week, the emphasis is all on billfish. Registration for the Black & Blue begins Tuesday; fishing commences Wednesday morning and continues each day through Friday. Recognized as the richest fishing tournament in the world, the B&B has awarded more than $62 million in prize money over the course of its 34-year history.